From January to August 2013, Anacor’s stock has more than tripled, rising from $3 to $10.24 a share. Analyst David Sobek attributes this to the results of Anacor’s phase III study, which indicated that Tavaborale was proven much more effective than placebos and the topical nail lacquer Penlac. However, Valeant Pharmaceuticals published late-stage toenail fungus research indicating a complete cure rate of 14.5% (9.7% when adjusted for placebo), which is several percentage points higher than Tavaborale. That being said, these minuscule numbers hardly suggest the miracle toenail fungus breakthrough we’ve all been waiting for. Fast-forward to April 2014: Sobek reports that Anacor’s shares are down 35%, but the company’s “$600 million-plus market value is still bloated.” They anxiously await FDA approval, expected on July 29th. In summary, Tavaborale is “overvalued” and “inferior,” Sobek writes. 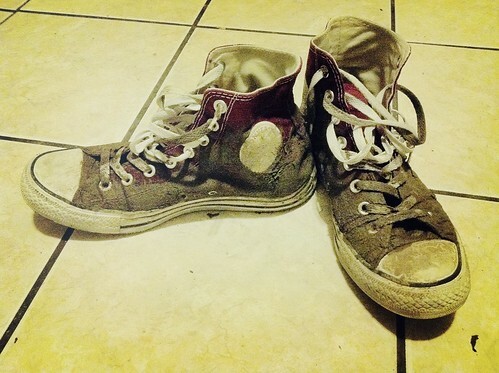 Dirty, contaminated shoes remain a common source of toenail fungus reinfection. Why Is Toenail Fungus so Difficult to Cure? – Topical treatments cannot get past the surface of the nail plate to treat the root of the infection. – Oral treatments can be hard on the liver, which remains a barrier to this method of treatment. – Both oral and topical treatments (including home remedies for toenail fungus) require a great deal of patient compliance, including application at least once daily for months on end. It could take six months or more to see progress, so many patients get disheartened and do not follow their daily treatment regimen as directed by their doctors. – Sheets, towels, and socks must be run through HOT laundry cycles with antifungal detergent. – Old toenail clippers must be discarded or effectively sterilized. – Contaminated shoes must either be disposed of or sanitized of fungal spores to prevent the continued reproduction of the colony. An ultraviolet shoe sanitizer is just what the foot doctor ordered. How Can We Cure Toenail Fungus? There is no easy answer, but we feel the best way to attack toenail fungus is with a multipronged approach. Treating the nail with a toenail fungus laser shows promise. Patients without liver problems can take the oral medication as well, while others may need to settle for a topical nail lacquer, like Tavaborale, instead. In addition, sheets, towels, socks, toenail clippers, and shoes must be treated. 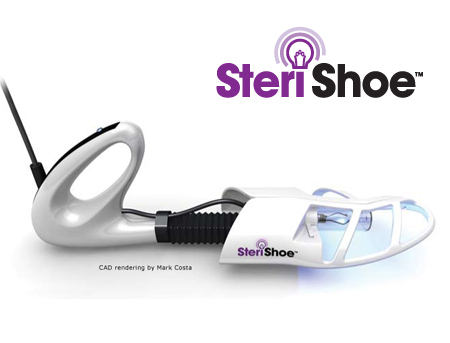 You can sanitize your shoes with our SteriShoe UV shoe sanitizer. Within 45 minutes, up to 99.9% of the living fungi and bacteria in your shoes will be eradicated through the deployment of ultraviolet light inside a protective shoe-bag. Using the device daily can greatly reduce the likelihood of toenail fungus recurrence. Learn more and buy one here.